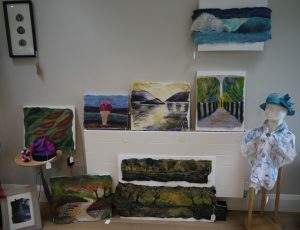 This weekend saw my very first Open Studio weekend. It was great to meet some fellow felters from Wirral. 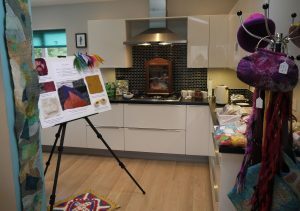 There was a really positive response to my work and I was able pass on my enthusiasm for felting on to my visitors. 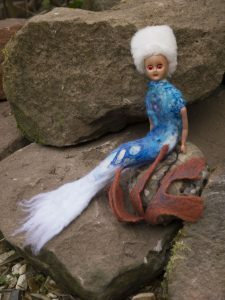 As there seemed to be a good level of interest in me offering feltmaking classes, I will be investigating possible venues soon. Recently I attended Shore Cottage Studio for a two day class in laser cutting. I took along some felt I had made from two layers of Merino wool and a design based on the cross section of an onion. The pen drawing was scanned and converted to a CAD outline telling the laser where to cut. 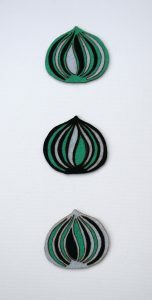 The end result was three sliced onions created from separate pieces of felt which I then interchanged in the same manner as traditional mosaic felt. I have been attempting to capture the essence of Linn Park, Glasgow for a while now and thought I would share my latest attempt. The lower picture shows my initial layout laid onto a design board. If you would like to experiment with designs then please make yourself a design board. It is just a flat piece of felt made from 2 layers of a coarse wool such as Norwegian. The design board gently holds the fibres in place whilst you play around with the design very effectively. 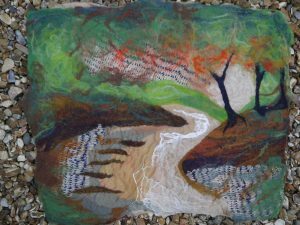 This design evolved into the top image which incorporates various silk fabrics and merino wool prefelts. Along with fellow members of the Re-View textile group I have been working on pieces for a new exhibition entitles Cabinet of Curiosities. Watch this space for more news on the exhibition date and venue. 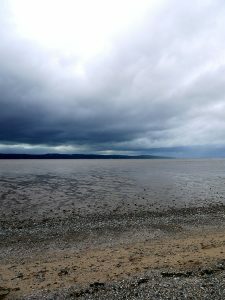 This piece is entitled West Kirby Walk and was inspired by a photo I took whilst walking on the beach there. 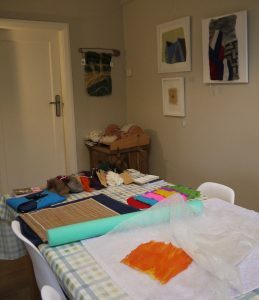 Merino wool was embellished with silk paper and silk fibre then wet felted and stitched. This work has been donated for auction to raise funds for the charity MIND. Update: We raised an amazing sum of over £1500 on Friday 15th april. 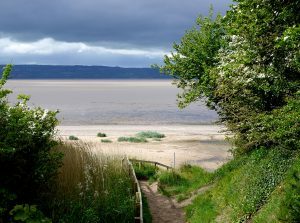 As the final lot in our auction, “West Kirby Walk” raised £50. 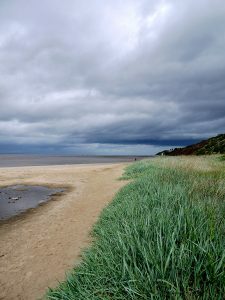 Please excuse the lack of content – this website is a work in progress and will be developing over the next couple of months. Please come back soon and see what has changed!